Open every day from the beginning of April from 10am to 5pm with the last entry to the site being 4pm. 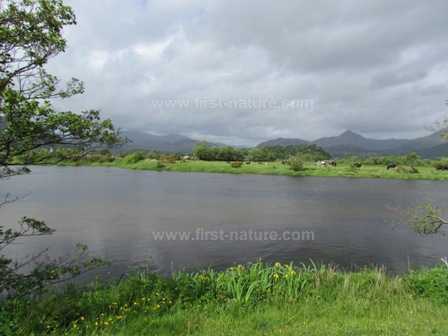 Please consult the new website at www.glaslynwildlife.co.uk for up to date opening times and other visiting arrangements. Ospreys made a return to the lower Glaslyn Valley to breed in 2004, and they have been coming back to the same nesting area every year since despite storm damage to their nest which led to the death of both chicks that year. In 2011 the male Osprey returned early, arriving on 17th March. Following the arrival of a female shortly afterwards, the pair settled into the nest and the female laid three eggs. All three eggs hatched that year, which was a cause for great celebration. 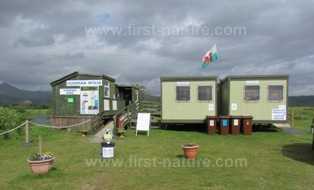 Glaslyn Wildlife has an excellent information and viewing centre at Pont Croesor near Porthmadog. It is manned by staff and volunteers. At this site you can find out more about the Glaslyn Ospreys, see a life-size copy of an Osprey's nest, and also watch the birds feeding their chicks via a live video link. There are also a nature trail for children and a mini shop. From Tremadog (on the outskirts of Porthmadog) take the A498 road passing through the village of Prenteg. Just after leaving Prenteg take the right-hand turn onto the B4410. Continue down this narrow road for 500m (300yds) until you come to the Ffestiniog Railway Station on a sharp left-hand bend of the road. Enter the railway station car park, carry on up and across the railway line, and continue down into the RSPB car park. There is a staffed information centre with a small car park. At the mini RSPB shop it is possible to buy snacks, drinks and ice creams. The centre has a public toilet. There is access for disabled visitors to the centre to see the live video link, and a good path leads to the model nests. Ospreys return to the same nesting site year after year and add material to the nest each time they arrive. 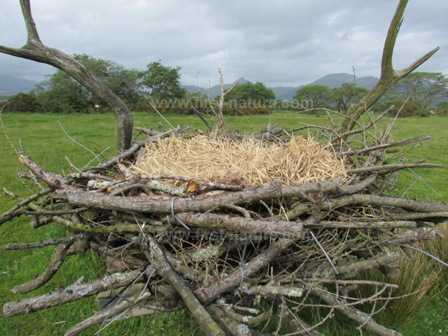 Some nests have been known to be used every year for 20 years. The birds also tend to remain faithful to their partner throughout their productive lifetimes. Ospreys breed from about 3 to 5 years of age onwards and can raise two or three chicks each year. The eggs are incubated for about 35 days, and the chicks will usually hatch two or three days apart. It is vital for Ospreys to have access to medium-size fish on which to feed, and it is an amazing sight to see one of these birds plunging a metre or so into the water and then rising up with a fish held tight in its talons. Once hatched, the chicks will be fed by their parents for a period of approximately two months and will remain in close proximity to the nest for about another two months once they are able to fend for themselves; then they set off to spend the winter in Africa. Ospreys were driven to extinction as breeding birds in the UK by the early 1900s as a result of being shot or poisoned, and because of the destruction of their breeding habitats. Today these magnificent birds are afforded the highest degree of legal protection, and there is concerted conservation action aimed at extending the birds' territory within the UK. There are a number of sites in Scotland where Ospreys nest and breed, and we now have two sites where Ospreys breed successfully in Wales.